Keeping the outside of your home clean can be quite challenging especially if your home is on a larger property. 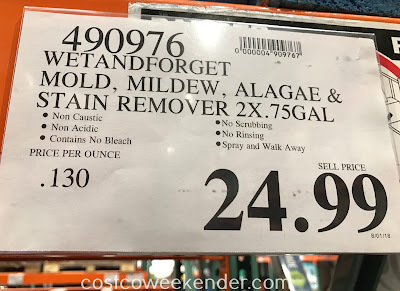 That's why it would make sense to get Wet & Forget Mold Mildew & Algae Stain Remover for some of the surfaces around your house. 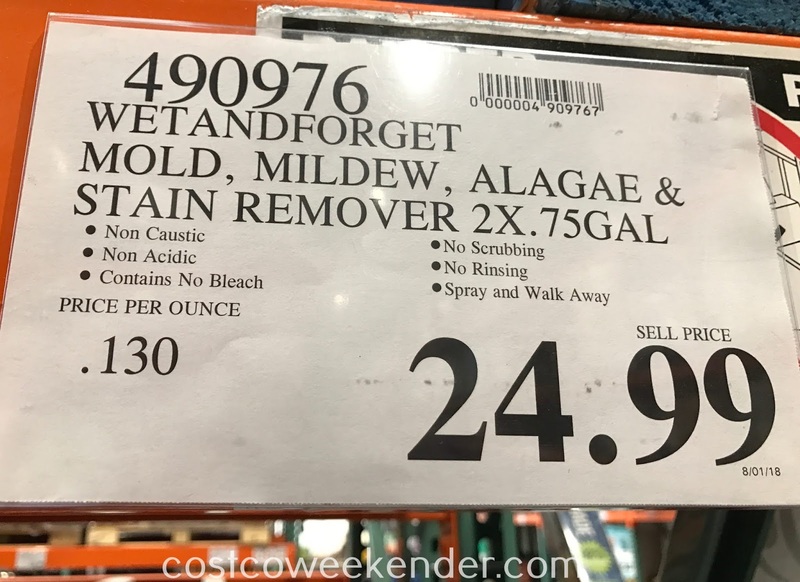 As its name indicates, it can handle mold, mildew, and algae that has formed on surfaces that probably is constantly damp and doesn't get a lot of sunlight. 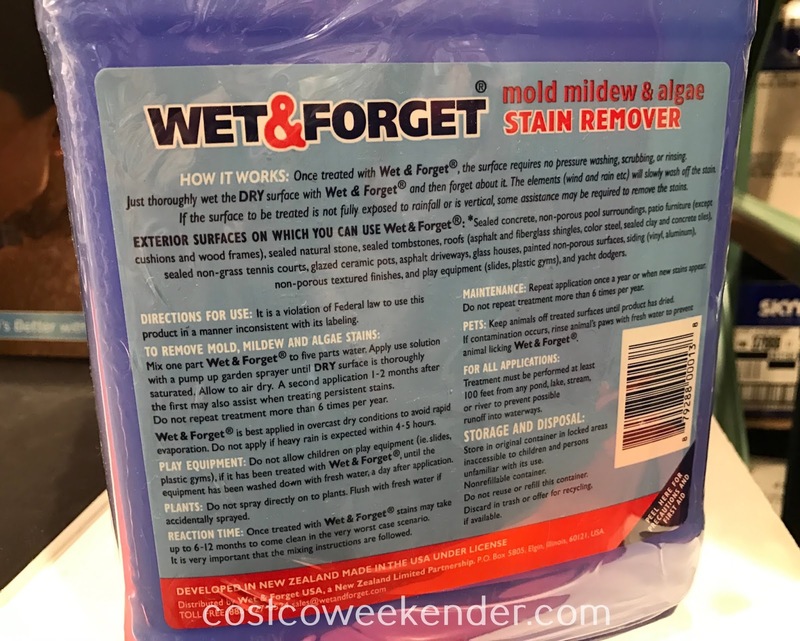 You definitely don't want mold to form anywhere near your house since it can damage your home if it remained untreated, so be sure and get Wet & Forget Mold Mildew & Algae Stain Remover and keep it in your garage for when the event arises. 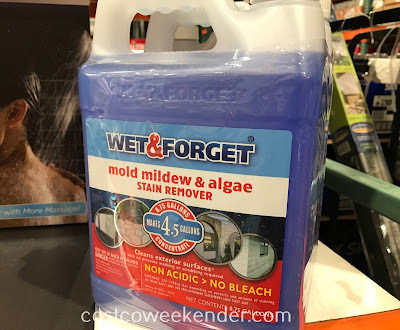 You probably won't find a better cleaning solution for mold, mildew, and algae. HOW IT WORKS: Once treated with Wet & Forget, the surface requires no pressure washing, scrubbing, or rinsing. Just thoroughly wet the DRY surface with Wet & Forget and then forget about it. The elements (wind and rain etc) will slowly wash off the stain. If the surface to be treated is not fully exposed to rainfall or is vertical, some assistance may be required to remove the stains. EXTERIOR SURFACES ON WHICH YOU CAN USE Wet & Forget: Sealed concrete, non-porous pool surroundings, patio furniture (except cusions and wood frames), sealed natural stone, sealed tombstones, roofs (asphalt and fiberglass shingles, color steel, sealed clay and concrete tiles), sealed non-grass tennis courts, glazed ceramic pots, asphalt driveways, glass houses, painted non-porous surfaces, siding (vinyl, aluminum), non-porous textured finishes, and play equipment (slides, plastic gyms), and yacht dodgers. 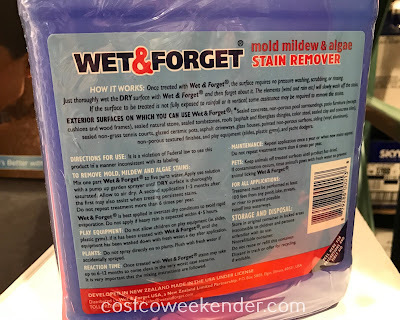 TO REMOVE MOLD, MILDEW AND ALGAE STAINS: Mix one part Wet & Forget to five parts water. Apply use solution with a pump or garden sprayer until DRY surface is thoroughly saturated. Allow to air dry. A second application 1-2 months after the first may also assist when treating persistent stains. Do not repeat treatment more than 6 times per year. PLAY EQUIPMENT: Do not allow children on play equipment (ie. slides, plastic gyms), if it has been treated with Wet & Forget, until the equipment has been washed down with fresh water, a day after application. PLANTS: Do not spray directly on to plants. Flush with fresh water if accidentally sprayed. REACTION TIME: Once treated with Wet & Forget stains may take up to 6-12 months to come clean in the very worst case scenario. It is very important that the mixing instructions are followed. MAINTENANCE: Repeat application once a year or when new stains appear. Do not repeat treatment more than 6 times per year. PETS: Keep animals off treated surfaces until product has dried. If contamination occurs, rinse animal's paws with fresh water to prevent animal licking Wet & Forget. FOR ALL APPLICATIONS: Treatment mjust be performed at least 100 feet from any pond, lake, stream, or river to prevent possible runoff into waterways. STORAGE AND DISPOSAL: Store in original container in locked areas inaccessible to children and persons unfamiliar with its use. Nonrefillable container. Do not reuse or refill this container. Discard in trash or offer for recycling, if available.